Thebes Land is a right tricky little mindbender. Ostensibly an exploration of patricide, it immediately makes a beeline for metatextuality as it dramatises its own writing and production. Yet this isn't simply a peek behind the creative curtain; it's (among other things), a mischievous lesson in tells fibs to the audience; a warning of the dangers of a playwright becoming too close to his subject; a Spinal Tap style satire of drama luvvies; and an intellectual exercise in literature and mythology. All that said - what the play is actually about is the relationship between playwright 'T' (Trevor White) and Martin Santos, incarcerated in Belmarsh prison for the murder of his father. 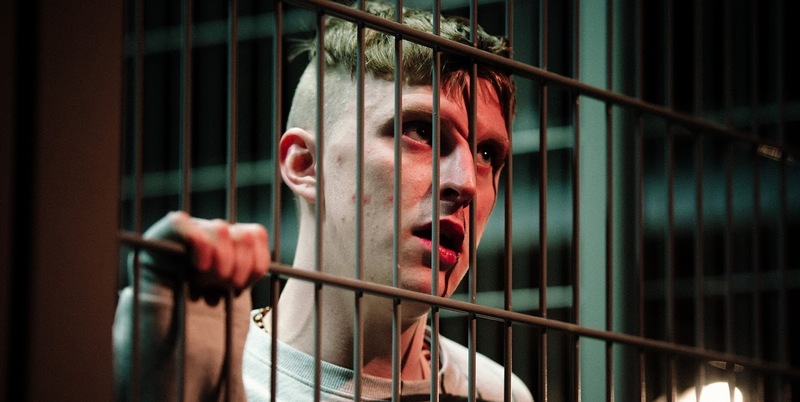 Extensive negotiation with the Ministry of Justice has let him appear at the Arcola for the duration of the run, with the proviso that he be confined to "a secured and metallic fence a minimum of three metres in height separating the inmate from the audience". Said fence is a sturdy sight: an imposing slice of prison austerity plonked down in the middle of a trendy Dalston theatre. The meat of the play is watched through this fence; the interior floor blank concrete, adorned with only a bench and a scuzzy looking basketball hoop that's seen better days. Though the Arcola have followed the Ministry of Justice's requirements to the letter, you can't help but feel a tingle of nervy danger at having a no-kidding, actual, honest-to-god murderer sat in the same room as us. Right now you're probably thinking that shipping a guy who stabbed his Dad to death with a fork to an East London theatre for an audience to gawp at is both implausible and morally iffy. Well you'd be right. You see, due to a sudden volte-face by senior Justice Ministers, 'Martin' is actually being played by aspiring young actor Freddie, who is in turn being played by aspiring young actor Alex Austin. But don't worry, the 'real' Martin is in still the audience under armed guard. Thebes Land delights in pulling the rug out from under us, one minute assuring us that we're seeing one thing, the next explaining that we're actually seeing something completely different, and so on. Objective 'reality' soon slides into a woozy haze: the play so mercurial that the audience collectively decides to trust nothing. Naturally, it's at this point that the show starts doling out some truth bombs. Martin's father/victim is described as a very bad man indeed: violent, sadistic and brutal. He's the kind of person for whom it's difficult to summon much sympathy, even as we imagine him being forked to death by his crazed son. Thebes Land dwells at length on their twisted familial relationship, the father blaming the son for his wife's uterine cancer and repeatedly calling him "whore". So, the mother's womb becomes a symbol of decay and death, and fatherly pride is transformed into misogynistic disgust. The patricide becomes a weird symbol of psychological self-harm - a cathartic way for a son to perform self-surgery and remove his own tumour. Playwright Sergio Blanco touches repeatedly on the Oedipus legend, as well as touching upon The Brothers Karamazov, not to mention the play's own characters musing on whether they've ever wanted to kill their fathers. Unfortunately, the play's dalliance with Freud somewhat peters out in the final scenes, settling for a pleasantly ambiguous embrace between two men who could be friends, lovers or an ersatz parent and child. It's a hell of a play. Though it delves deep into darkness it's also extremely funny; thanks to a nimble and punchy translation by Daniel Goldman. It's beautifully performed - each character bristling with substance and humanity. On top of all that it looks amazing and makes fantastic use of AV stagecraft as it deconstructs itself. What more do you need? It's a winner! Go go go! Thebes Land is at the Arcola Theatre until 23rd December. Tickets here.